I swear. That wasn’t the intent. But it’s kinda funny how I’ve found something semi-interesting to say about toilet products that applies to my log home site, my fun times site, and this feet site. So, what do toilets have to do with feet, you ask??? I’ve used pumice stones (on my feet) before. My mom got me hooked when I was a teenager. And I’ve continued to use them regularly — any time I want to treat myself to an amazing home-style pedicure. The only difference between then and now is… I now have pumice stones to last me a few years! And I got ’em for FREE. You see, I ordered 3 sets of Don Aslett’s toilet cleaning system recently. And as part of the “set” I got a huge “professional grade” pumice stone in each one. (They’re great for removing toilet rings.) That means 3 top-quality pumice stones! These are about twice as large as most pumice stones that you buy for your feet in the health & beauty department in stores. And those usually sell for around $5 apiece (for half the size). So that means I got about $30 worth of pumice stones… for free! That, or I got the toilet cleaning caddies for about 9 bucks each (…as opposed to their $19 retail price). Either way, it was a win-win for me. I’ve never had stains in the toilet bowl which required a pumice stone — yet. So for now, these beauties are being used as luxury foot scrubbers instead! Thanks, Don Aslett! 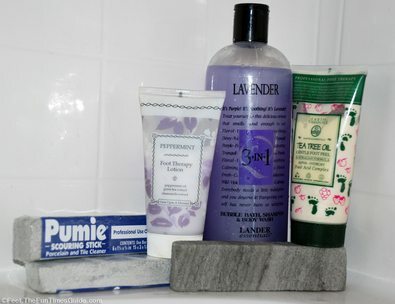 Want a pumice stone just like these? Get ’em as low as 2 bucks, or buy in bulk here! Looking for more “outside the box” ideas. I’ve got a running collection here. A few more great pedicure tips to consider. Household uses for a pumice stone.